The objective is to setup VNC server on Ubuntu 18.04 Bionic Beaver Linux. If you wish to make your firewall rules more strict or allow range of ports for multiple VNC sessions visit our How to Open/Allow incoming firewall port guide for more information. You can now use any VNC client to connect to your new Ubuntu VNC server. This guide will use the xvnc4viewer client. Enter your password created previously as part of the above "Ubuntu VNC server setup" section. Established VNC connection to Ubuntu 18.04 VNC server. Note, it is also possible to run a secure VNC client/server connection via the SSH tunnel. Given that you have the SSH user access (in this case username linuxconfig is used) to your VNC server eg. 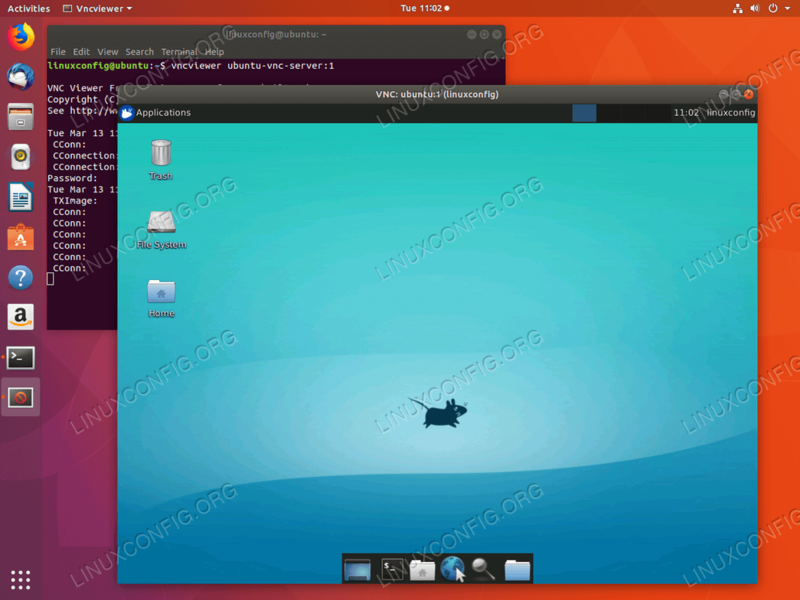 ubuntu-vnc-server. First, create an SSH tunnel on a local port 5901 leading to a remote port 5901 on your VNC server. Although the current configuration works, one might want to setup a systemd startup script in order to easily manage multiple VNC desktop sessions.